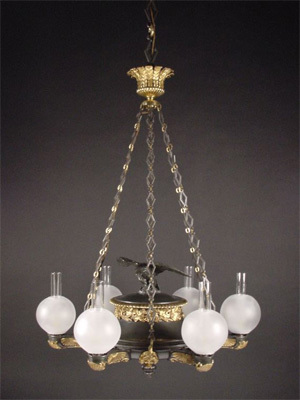 This is a Regency bronze and ormolu Colza oil hanging light, 1345mm high and 965mm in diameter. It originally hung in the great banqueting hall at Gawthorpe (see photo below), but at some point after 1884 the light was sold. 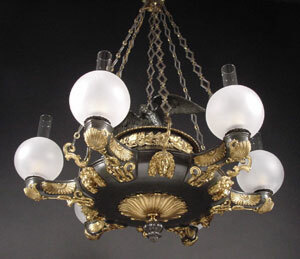 In 2001 the light was made available for sale at a London auction house, and The National Trust re-acquired it for return to Gawthorpe. The light had been converted to electricity and had modern replacement clear globes and chimneys. Its condition was generally sound, with the exception of surface dirt and tarnish, loose fixings and outdated electrical wiring. As part of the conservation, all the old electrical wiring and fittings were removed and replaced with Edison bulb holders and certified new wiring. The light was cleaned and general repairs made to the fittings. The bronze elements were cleaned, removing a small amount of corrosion spotting, then the surface waxed and buffed. New frosted white globes were produced to replicate the originals and new clear chimneys made to fit. 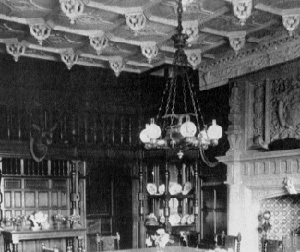 The archive photograph (below left) shows the hanging light at Gawthorpe (the banqueting hall now made into a dining room). James Deville was a plaster figure maker and lamp manufacturer based in The Strand. He died in 1846.